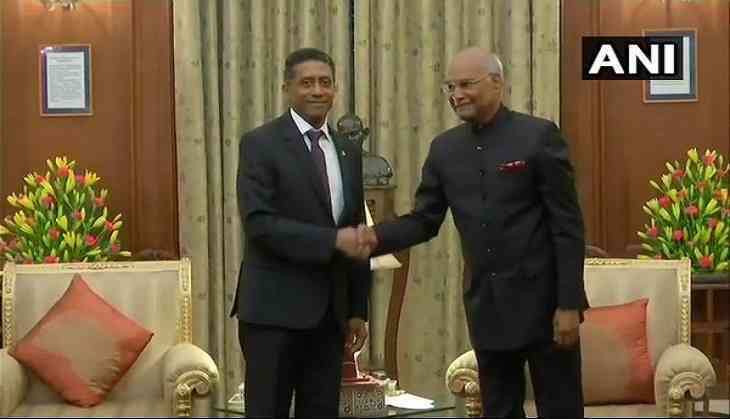 President Ram Nath Kovind on Monday met his Seychellois counterpart Danny Faure and held a banquet in his honour at the Rashtrapati Bhavan here. The banquet was attended by Prime Minister Narendra Modi, External Affairs Minister Sushma Swaraj and Congress leader Mallikarjun Kharge among others. Danny Faure, who is on his first bilateral visit to India, earlier in the day sang a song at the lunch hosted by Prime Minister Modi at Hyderabad House. President Faure sang a rendition of a song named 'Mon Pei Sa' while playing a musical instrument as Prime Minister Modi applauded for him. On a six-day visit to India, the President arrived here on June 22. As part of the visit, President Faure issued a joint statement with Prime Minister Modi and the two leaders called for strengthening bilateral defence relations and expanding trade. India and Seychelles also signed multiple Memoranda of Understanding in the fields of data sharing, culture, information technology, and education.